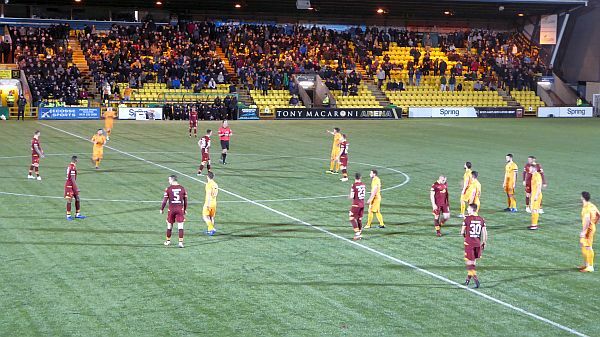 Motherwell failed to engage with the direct methods offered by Livingston and lost 2-0. It was a disappointing afternoon for the ‘Well fans in the crowd of under 2,000. Gone was any of the free flowing football that brought us three wins from the previous four games. At no stage did it look likely that we would take anything from the game. Livingston dominated from start to finish. Motherwell started with Barry Maguire filling the gap left by the suspended Peter Hartley He was on Tom Aldred’s left with Christian Mbulu on the right of the three central defenders. David Turnbull, in the all maroon strip, got the game underway. Livingston had the better of the early exchanges and our defence was tested as a series of corners and long throw-ins rained into our box. In 13 minutes they almost scored when Lawless found the ball at his feet but somehow Gillespie made the save from four yards out. Lawless made no mistake when he got on the end of another throw from Lithgow in 22 minutes. The low drive beat Gillespie. We were struggling to cope with the opposition’s direct style. Livingston fired the ball into our box at every opportunity and we seemed to have no answer. Maguire moved forward as we switched to a back four and searched for the missing rhythm but the home side continued to produce goal scoring chances. Hamilton and Lawless were wasteful. Kelly had yet to make a save. Alex Rodriguez-Gorin replaced Gael Bigirimana as the second half started and Maguire moved ro right back with Grimshaw moving up. The manager saw no improvement and Frear was introduced as Campbell was removed. Just after the hour Bowman replaced Main. It looked like an unlikely equaliser had arrived after 78 minutes. Gorin’s deep cross found Maguire with only Kelly to beat but the ‘keeper produced an excellent save. We paid the price minutes later when Halkett headed a corner above the packed six yard box and into our goal. The goal snuffed out any slim chance of us sneaking an undeserved point. It was surely the worst performance of the season...so far.